The NET publication includes essays, a glossary, forums, interactive works, and videos. Writing from Bruce Sterling, Brenda Laurel, Phil van Allen, Anne Burdick, Holly Willis, and Nik Hafermaas is joined by NET projects designed by Art Center students, friends, and faculty. Each of the four media components – book, dust jacket / poster, website, and wap – relates to the others: place the book on the poster to see additional imagery; point your mobile phone camera at barcodes on the poster and watch videos; browse URLs in the book and move to a dialogue online. A limited edition of 500 books is available for purchase at Amazon.com . In September 2008, the entire book will be available as a pdf on this site, however it will not include the NET book jacket/poster, which is an essential piece of the transmedia experience. We encourage you to order your book now as we anticipate selling out quickly. 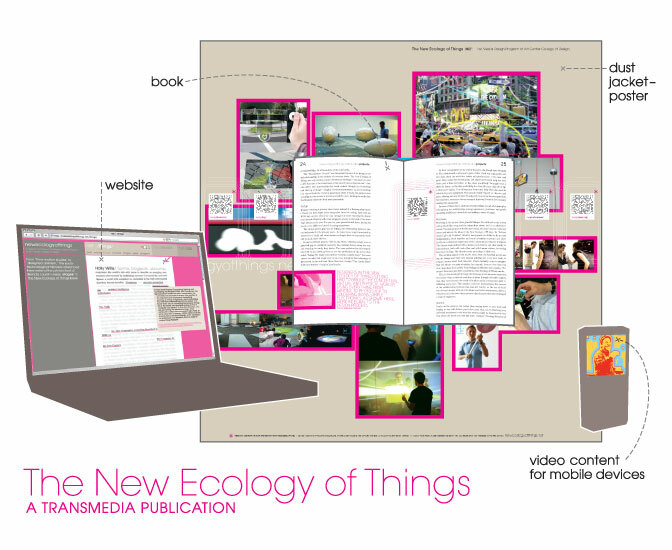 The New Ecology of Things transmedia publication was created by students and faculty in the graduate Media Design Program (MDP) at Art Center College of Design in California. Proceeds from the sale of the book will be used to fund student grants for work related to the New Ecology of Things.